Calling of Peter and Andrew, Duccio di Buoninsegna, 1308-11. Calling of Saints Peter and Andrew, Master of the Brussels Initials, 1389. Getty Museum. The Calling of St. Peter, Hans Süss von Kulmbach, 1514-16. Web Gallery of Art. The Miraculous Draught of Fishes, Albrecht Dürer, 1500. Biblical Art on the WWW. The Calling of Matthew, Vittore Carpaccio, 1502. Web Gallery of Art. The Miraculous Draught of Fishes, Raphael, 1515. Web Gallery of Art. The Miraculous Draught of Fishes, Pieter van Aelst, 1519. Christus Rex. The Miraculous Draught of Fishes, Raphael, 1519. Web Gallery of Art. The Calling of Matthew, Marinus van Reymerswaele, 1536. Web Gallery of Art. Jesus Summons Matthew to Leave the Tax Office, Jan Sanders van Hemessen, 1536. Olga's Gallery. Draught of Fishes, Joachim Beuckelaer, 1533. The Getty. Teaching and Fishing, Kirchen Postilla, das ist, Auslegung der Episteln vnd Evangelien, von Aduent bis auff Ostern, 1550. Pitts Theology Library Digital Image Archive. The Abundant Capture of Fish, 1593. Evangelicae Historiae Imagines. The Calling of Saint Matthew, Caravaggio, 1599-1600. Web Gallery of Art. Landscape on the Coast with the Calling of St Peter and St Andrew, Jan Brueghel the Elder, 1608. Olga's Gallery. The Calling of Saint Matthew, Hendrick Terbrugghen, 1621. Web Gallery of Art. A Miraculous Draught of Fishes, Rembrandt, c. 1655. The Words online. The Calling of Saint Matthew, Claes Berchem and Jan Baptist Weenix, 1657. The Calling of St. Matthew, Juan de Pareja, 1661. USC Annenberg School for Communication. The Miraculous Draught of Fishes, James Thornhill, ca. 1729-31. Royal Academy of Arts. The Miraculous Draught of Fishes, Johann Georg Platzer, c 1730. Residenzgalerie Salzburg. Wonderful Catch of Fish, Anton Losenko, 1762. CGFA. The Miraculous Draught of Fishes, Alexandre-Gabriel Decamps, c. 1853. The Wallace Collection. 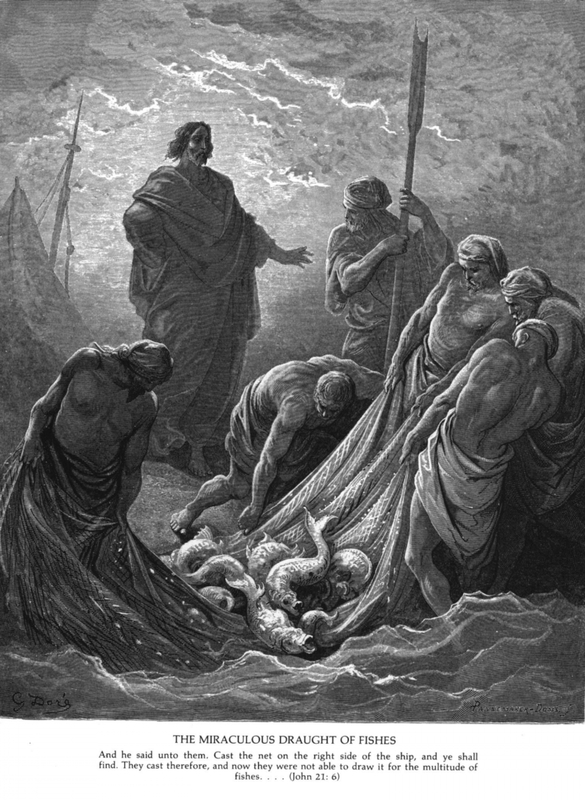 The Miraculous Catch of Fish, Gustav Dore, 1865. Felix Just's "Gospel of John" site. The Calling of Levi, James Tissot, 1886-96. Biblical Art on the WWW. The Calling of Saint Peter and Saint Andrew, James Tissot, 1886-1894. Brooklyn Museum. Nathanael under the Fig Tree, James Tissot, 1836-1902. Brooklyn Museum. The Miraculous Haul of Fishes, Henry Ossawa Tanner, 1927. National Academy Museum and School of Fine Arts. Miraculous Fishing and Calling 12 Apostles, Edouard Leon Louis Edy-Legrand, illustrator, La Bible- Nouvelle traduction de François Amiot et Robert Tamisier, 1950. The Calling of Peter, Otto Dix, 1960. The Mary Page. 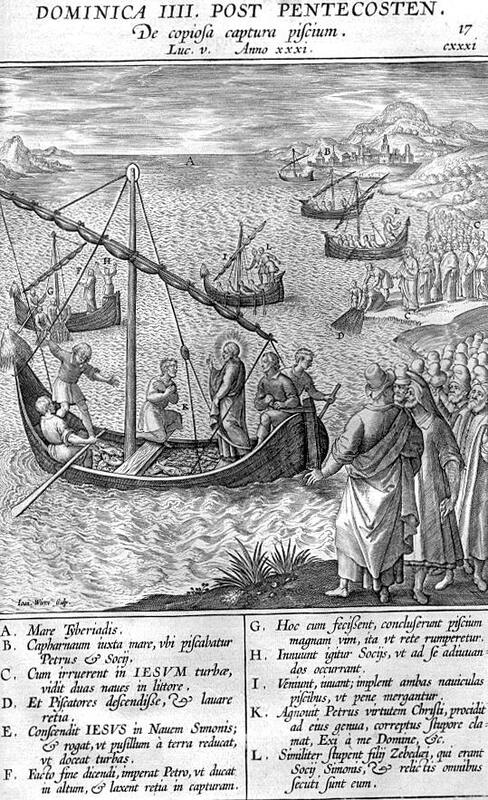 Miraculous Fishing & Calling 12 Apostles, Eric de Saussure, Textes de la bible de Jérusalem-Les pressesde Taizé-Seuil, 1968. Calling the Disciples, Bertrand Bahuet, 1995-96, fresco. Surprise at Galilee / First Steps in Faith, Robin Jensen, "The Apostle Peter: Just a Simple Fisherman," contemporary. Scroll Right. Calling Disciples - Betty Grable, Miraculous Catch - Ingrid Bergman, "Hymn to Her," collage by Karen Whitehill, contemporary. The First Two Disciples, African Mafa. Calling Disciples, He Qi, China. Christ Calls His Disciples, Raj Solomon. The Miraculous Catch of Fish, stained glass, Saint Peter Church, Torrington, CT. The Miraculous Catch of Fishes, stained glass, Calvary Presbyterian Church, Newburgh, NY. Miraculous Catch of Fish, unknown. Calling the Twelve, Spanish Master, unknown. Calling of the First Four Disciples, Frank Wesley. Calling of the Twelve Apostles, Greek Icon.